Most people choose to drive themselves around Scotland. 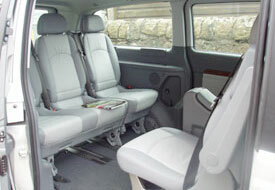 However, there are many different transportation options in Scotland available for small and large groups who want to relax and let someone else do the driving. 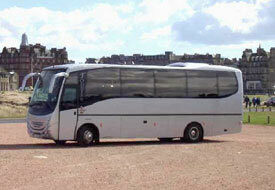 Driver/guides in Scotland are very professional and experienced. A good driver/guide has a way of understanding what a group is like within just a few minutes. 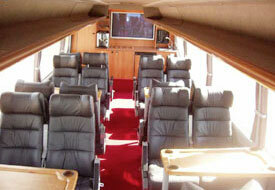 They’ll lead you to great restaurants, nightlife and sightseeing that you might not have found on your own. Ask a Golfpac representative to price your quote with a driver guide! Rental cars are easy to obtain but are generally smaller than most American rental cars. It is necessary to carry with you a valid driver's license and a credit card (used only as a guarantee) as the rental car company will require both at the time of rental. 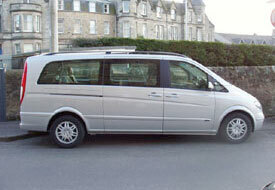 The renter must be over the age of 21 and a young-driver surcharge applies for drivers between 21 and 25 years of age. For renters over the age of 70, a driving test may be given to assure the company of the person’s driving ability. However, most rental car companies reserve the right to refuse to rent when they believe the client can not handle UK road rules and conditions.